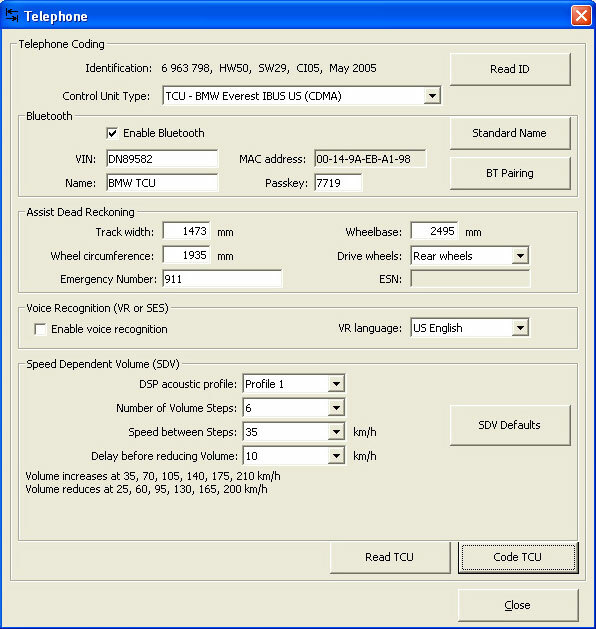 Freely available for many years and popular with BMW enthusiasts, NavCoder software allows the user to program (configure) navigation computers, telephone control units (TCUs) and other devices and settings, such as daytime running lights. NavCoder can "see" any device that communicates on your car's I-bus (such as your radio). 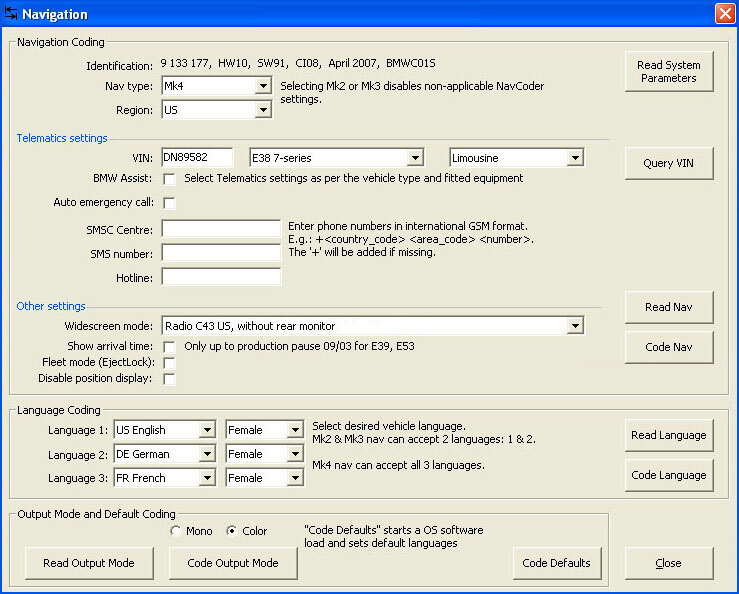 NavCoder also reports fault codes for all I-bus devices. But faults are reported in raw hexadecimal format. And without a cross reference to convert hex codes to standard fault codes, they're unfortunately of no value. Download NavCoder onto an old laptop computer (navcoder.com). You'll also need to purchase the "Resler" USB interface (resler.de), about $35, to connect your computer to your car. Installing the software is straightforward. Using the Resler interface is not. To begin, the Resler interface offers no specific interface-to-car connection, only loose wires. It's made to connect to any source which has both power and access to the car's I-bus data line. For many, including myself, the CD changer power plug (in the trunk, left side) is the most convenient. If you have a CD changer in place, you'll need to unscrew the changer from its mounts in order to gain access to the plug underneath. And in order to access the CD changer, remove the nav computer, to allow the left-side trim to come out. Now connect to the CD changer power plug as shown in image panel B above. Depending on your specific computer, you may need to install drivers for the Resler interface. After that, plugging in the Resler device no longer produced a Windows prompt recognizing the device, nor did it appear in the directory tree of Windows Explorer. This worried me at first. However, when connected to the I-bus (with ignition in position 1), NavCoder recognized the device and read data successfully. Once your Resler interface is ready, simply plug-in and set your ignition key to position 1 (accessory). With NavCoder running, you should begin to see data. No user manual exists for NavCoder. It was designed to be self-explanatory. Click the Read Nav button (middle right) to get the configuration of the nav computer currently connected (hopefully, your new Mk4!). To begin, set your nav type and verify Region is set to "US". BMW Assist is a roadside assistance program similar to GM's OnStar service. It is no longer supported in the E38 7-series. Therefore, all options under "Telematics settings" are obsolete. Un-check "BMW Assist" and "Auto emergency call". Nor is it necessary to enter your car's VIN, although doing so will make it appear on the Emergency screen. The "SMSC" and "SMS" phone numbers probably corresponded to the SOS and Concierge buttons in the headliner of cars with Assist. Since Assist is gone, these fields can be left blank. A "Customer Service" listing appears when bringing up the phone book in a factory phone system (such as a Bluetooth TCU). However it won't work without Assist, so it too may be left blank. In the Other settings section (center), verify the oddly-named Widescreen mode is set to "Radio C43 US, without rear monitor". (If you installed the newer BM53 radio, select it here.) And verify "Show arrival time" is NOT checked (for E38 7-series). Once finished, click the Code Nav button to set the configuration. How cool is that? Click Read ID to retrieve your TCU's type, then click Read TCU button (at bottom). From the top, verify "Enable Bluetooth" is checked. Enter your VIN to make it available on the "Emergency" nav screen. Enter a "Name" to appear on your phone when pairing via Bluetooth. Leave "Passkey" to match what's on the TCU label. In Voice Recognition, "Enable voice recognition" should be on (checked) by default. This is the correct setting for cars without an SES voice module. If your car has SES (from 8/00), be sure to deselect this option (turn off). Under Speed Dependent Volume, tighten the "Speed between Steps" to about 35kph to offset road noise. For those with DSP sound, this setting is tied to the DSP sound profile selected. Therefore, you can set different SDV's for each DSP profile available. When finished, click Code TCU button. NavCoder will prompt you to turn off ignition and wait 15 seconds before re-start.